NR: "...this has been one of the great unintended consequences of the surge." HEIDI COLLINS: To the war zone now. Defense Secretary Robert Gates on the ground in Iraq. 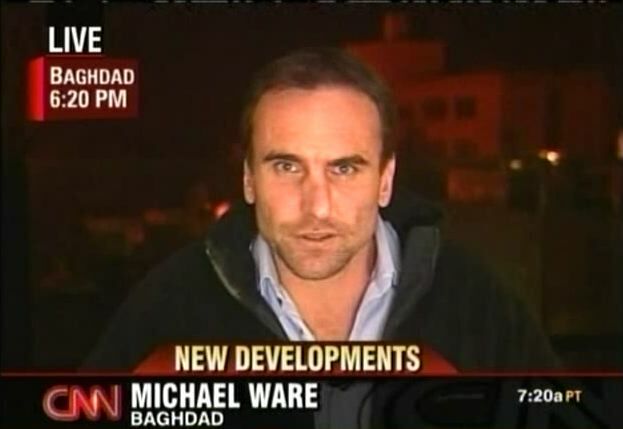 We want to go live to CNN's Michael Ware in Baghdad. Michael, have you had an opportunity to hear what Secretary Gates is saying about the situation there? MICHAEL WARE, CNN CORRESPONDENT: Yes, he's just given the briefest of brief press conferences where the Defense Secretary, not surprisingly, told us nothing new. He played his cards very close to his chest. This is his sixth visit here to Iraq, and according to those traveling with him, the reports are that he's here to assess the nature of Iran's involvement here in Iraq and to see whether the military gains and the downturn in violence can be sustained. Now, in the course of that, that's involved a number of meetings obviously with U.S. commanders and top Iraqi leaders. And during his briefest of brief press conferences, this is what he had to say about his meeting with Prime Minister Nuri al-Maliki. ROBERT GATES, DEFENSE SECRETARY: The prime minister and I had a productive discussion on a range of issues effecting the future of Iraq. As you know, there has been recent months of dramatic change in the security situation across the nation. A decline in violence to levels not seen since the Samarra mosque bombing nearly two years ago. As a result, there's been a substantial increase in the number of refugees returning home. International investment in Iraq is on the rise. And more than 70,000 Iraqis have taken it upon themselves to defend their neighborhoods. WARE: Yes, and what Secretary Gates is summarizing precisely the situation here. Since we've seen America backing first Sunni and now Shia militias to protect their own neighborhoods and deliver the reconciliation that this Iraqi government is not doing -- that the prime minister that the secretary met with is not delivering on -- there has been huge success. So this has been one of the great unintended consequences of the surge. And this is what has seen the great improvement here in Iraq is these neighborhoods protecting themselves with U.S.-backed militias. So the secretary has really hit the nail on the head. COLLINS: All right, CNN's Michael Ware live from Baghdad this morning. Michael, appreciate that. Thank you.